WTF President Chungwon Choue (4th from left at front row ), poses with WTF Reform Committee members in recent meeting. 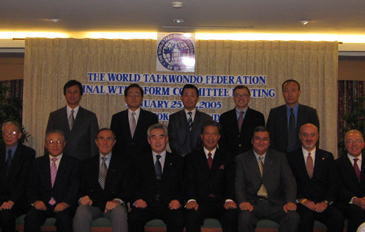 SEOUL (May 11, 2005) — The World Taekwondo Federation conducted a major organizational change of its headquarters and personnel reshuffle today in an effort to enhance the efficiency and responsiveness of its headquarters administration. In line with the recommendations of the WTF Reform Committee, the WTF newly created the Marketing Division and reorganized the International Affairs Division into the Planning and Finance Division, thus activating its marketing programs and enhancing its transparency in matters pertaining to finance. To better serve its member National Associations around the world, the WTF also nominated regional specialists. As part of its reform efforts to strengthen international and public relations activities, as well as headquarters staff training programs, the WTF also brought in two foreign and two local specialists. WTF President Chungwon Choue (2nd from right) is seen with IOC President Jacques Rogge (2nd from left), and other sports leaders during WTF extraordinary Executive Council meeting. Under the reshuffle, Choe Man-seek was appointed as deputy secretary general in charge of overall affairs related to the Planning and Finance Division and the Marketing Division. Lim Yoon-taek was appointed as the liaison officer for domestic affairs. Kim Hwan-pyo was named to serve as director of the General Affairs Division. Kim is also in charge of cooperation and assistance affairs for Spanish-speaking member National Associations. Park Jung-ae was appointed as director of the Planning and Finance Division. She also serves as director of the Marketing Division. 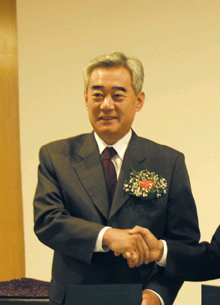 Lee Sang-heon was appointed as director of the Competition Division. Yoo Hai-min was named as director of the Refereeing Division. Kang Seok-jae was appointed as director of the Public Relations Division. Jerry Ling from Singapore was brought in to work for the Planning and Finance Division. He is also in charge of cooperation and assistance affairs for member National Associations in Asia and Africa. Jee Hee Vanden Berghe from Belgium was also named to work for the Planning and Finance Division. She is also in charge of cooperation and assistance affairs for member National Associations in Europe and French-speaking region. The WTF is fully committed to the continuous implementation of its reform program, in line with the reform policy of the International Olympic Committee. The world's taekwondo governing body, under a new leadership headed by Dr. Chungwon Choue, created a Reform Committee in November 2004 to work out a final reform report containing 215 recommendations in 16 major reform areas in February this year. 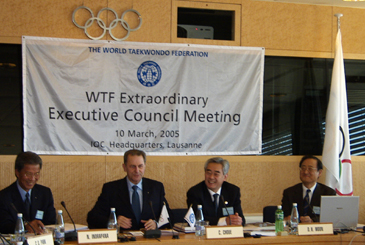 The WTF approved the recommendations at its General Assembly in Madrid, Spain on April 12, 2005, thus paving the way for its full-pledged reform. For further information, please contact Kang Seok-jae, director of the WTF's Public Relations Division (+82-2-557-5446 or +82-2-11-773-0241).